As seen on the "Paul Holmes Show", "The Living Channel", read in "The Press", "Otago Daily Times", "Auckland Herald", as well as featured in "Urbis "Architectural magazine. We are a small family run business. 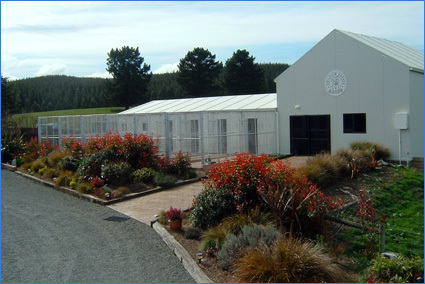 I designed and had the facility purpose built to best suit the dogs needs. We are about to have our 16th birthday and would like to thank all our clients some of whom are onto their 2nd and 3rd generation dogs for all their support over the years. I look forward to looking after your darlings whilst your off having fun and I look forward to meeting our future clients and guests. The guests of Shadow Estate Luxury Pet Resort will find all the essentials for an enjoyable holiday as we cater to all personalities. Anxious or shy dogs will find the experience stress-free and comforting. Active go-getter guests will enjoy making new friends and burning off excess energy during frequent exercise times in our huge grass play areas. We focus on establishing a routine with plenty of walks and proper nutrition and of course treats! We also give guests time to relax in their private room. With only a small number of guests we are able to give lots of hugs, kisses and personal attention to your canine family member. We have staff on site 24/7.